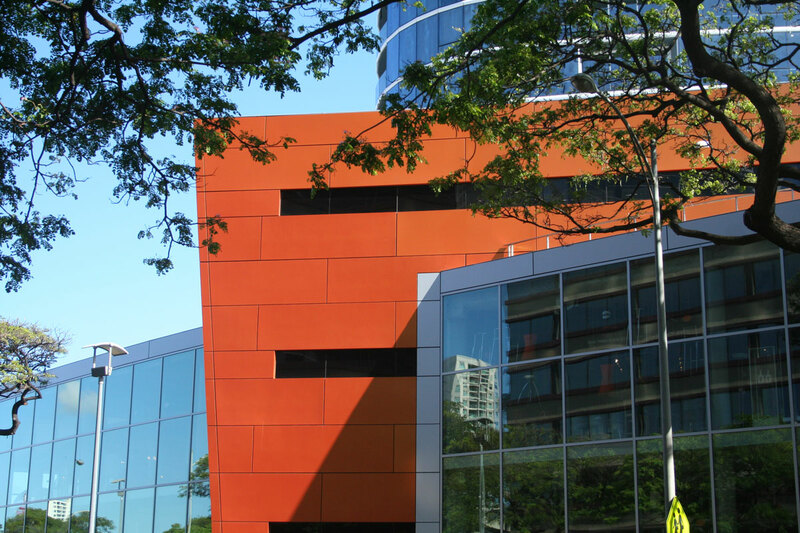 The Honolulu Design Center selected Alucobond Material composite panels as exterior curtainwall for its combination of bold color and sleek finish to accentuate its dramatic ultra-contemporary design. The result is a breathtaking artistic statement that reinterprets several of Hawaii’s iconic natural forms and unique island experiences. A stiffer design challenge than this is tough to imagine: Create a landmark home for the Honolulu Design Center that is uniquely contemporary for Hawaii, stands out yet fits into the naturally dramatic island backdrop, and puts the design center on an equal footing with centers in other major design cities around the world. 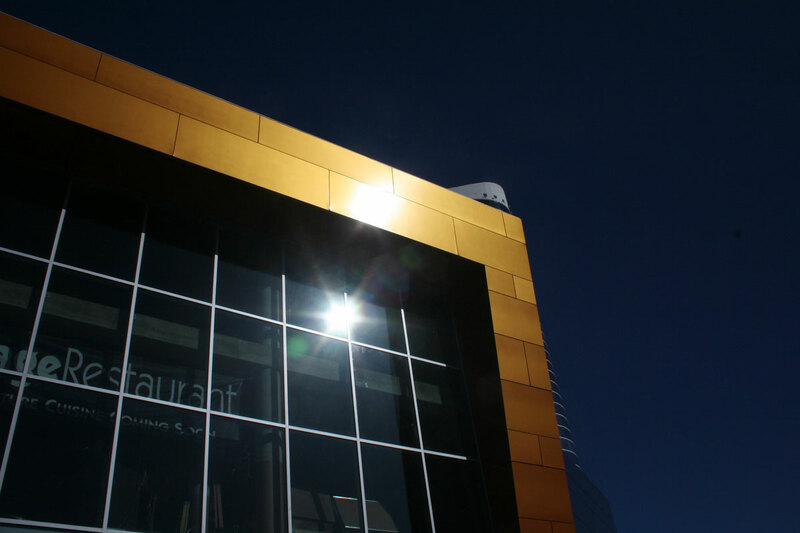 Alucobond PE Core met this aesthetic challenge with a nonchalance befitting the gold standard of exterior cladding. 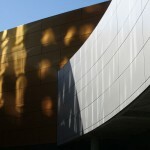 The block-long front of the Design Center curves in a concave form evoking ocean waves, while slight sloping at each end creates the illusion of a sloped surface referencing another iconic Hawaiian image, the edge of Diamond Head’s volcanic crater. 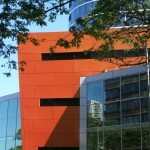 Design architect Matthew Gilbertson of RIM Architects enhanced the wave form by sheathing the façade in custom-created “Honolulu Red” Alucobond panels finished with a highly reflective pearlescent gloss that produces kaleidoscopic color changes in the panels from orange to bright red and even golden under various lighting conditions. Once again, color is used to reference iconic Hawaiian images – in this case the fiery hues of molten lava cooling as it flows to the sea. 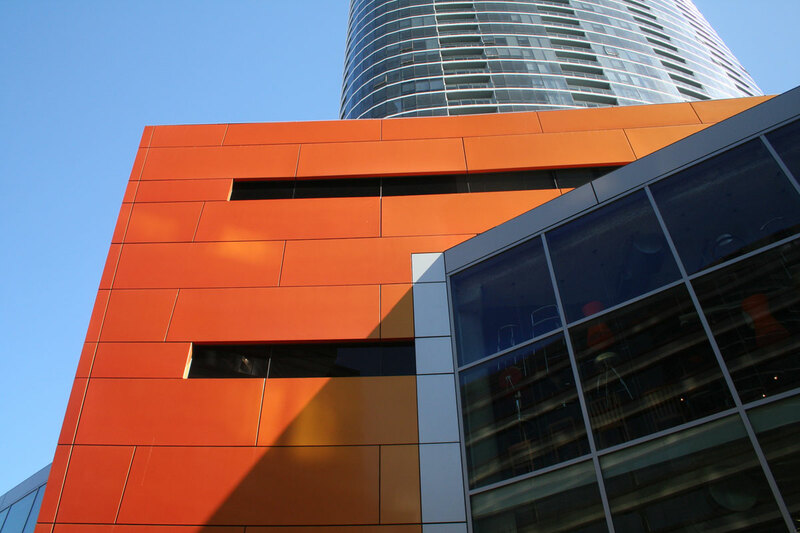 Silver metallic Alucobond panels are juxtaposed in a convex “reflected wave” that suggests the interplay of waves at water’s edge. 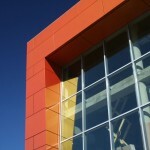 The bold lines and colors create a “wow” factor that draws the eye to the three-story, 80,000-sq. 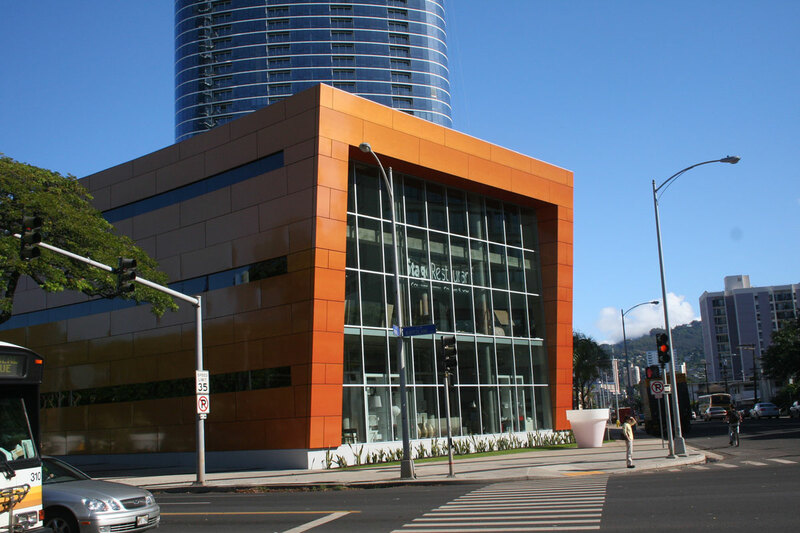 ft. Design Center – part contemporary furniture retailer, part gathering place for the entire Honolulu contemporary arts community – while huge expanses of glass on the convex front façade showcase the contents of the building and lure people inside. 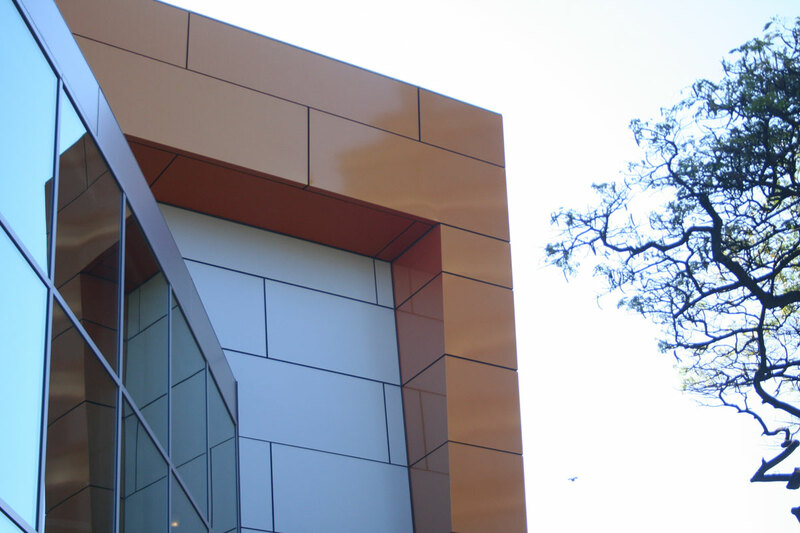 The variety of design elements incorporated into the project, including convex and concave curves, showcase Alucobond’s fabrication capabilities. 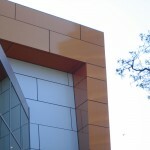 Elward Systems Corporation of Lakewood, Colorado, the fabricator of the 4mm-thick Alucobond standard polyethylene-core composite panels used on the project, employed its Secondary Guttered Rain-screen (SGR) wall panel system utilizing a route and return process. 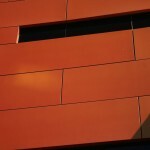 The system is designed to protect the panels from moisture and internally guttered to direct water to the bottom of the wall for efficient weepage. 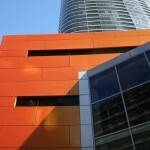 Architectural Glass & Aluminum of Oakland, California, performed installation on the project. 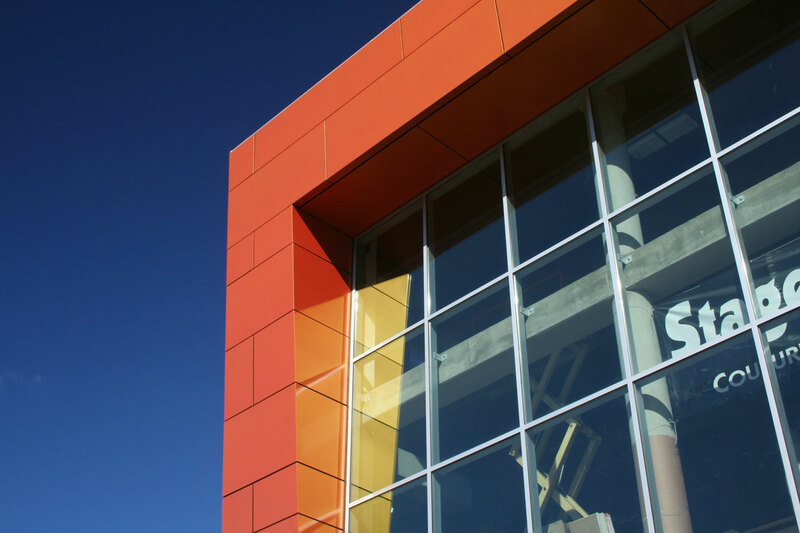 Logistics posed the biggest challenge for the fabricator, with the Alucobond material coming from the Benton, Kentucky, plant of 3A Composites USA, aluminum extrusions for attachment system coming from Portland, Oregon, and fabrication taking place in Lakewood, Colorado. 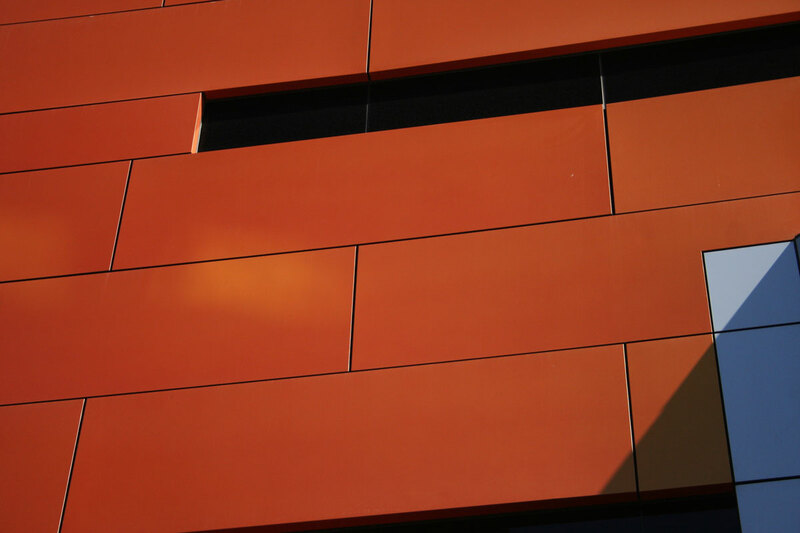 With roughly six weeks for shipping to Hawaii – leaving no margin for error in fabricating the custom-cut Alucobond panels – it’s easy to see why Elward is especially proud that it was able to complete the project with no adverse impact to the project’s schedule. 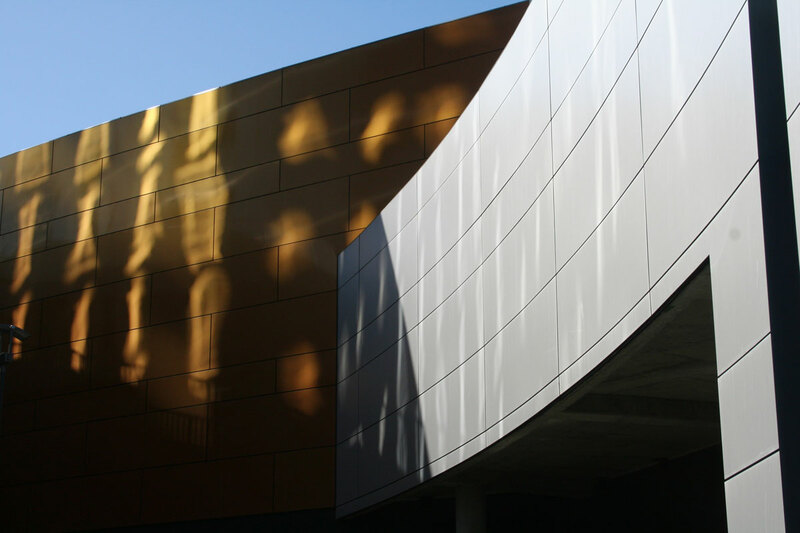 Working with the cold-formed curved panels on an incredibility tight project deadline made installation a challenge, said Dan Romine of Architectural Glass & Aluminum, Oakland, Calif., the installer on the Design Center project. 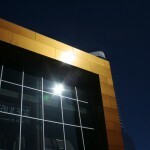 The contract was awarded in February, Elward Systems started shipping panels from Lakewood in June, and AGA began installation in late July. 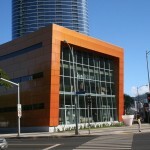 AGA, which had worked on previous Alucobond installations with Elward, including the San Francisco International Airport, completed the installation in four months, giving the owner plenty of time to ready the spectacular addition to Honolulu’s skyline for its “soft” opening in December 2006 and grand opening in April 2007.